Thank you all for the wonderful birthday wishes, your lovely comments made my day a memorable one.. You guys are the best! loved both the blazers ! And the neon nails -WOW ! Both are amazing! Love that floral skirt, so pretty. OOoo I like! 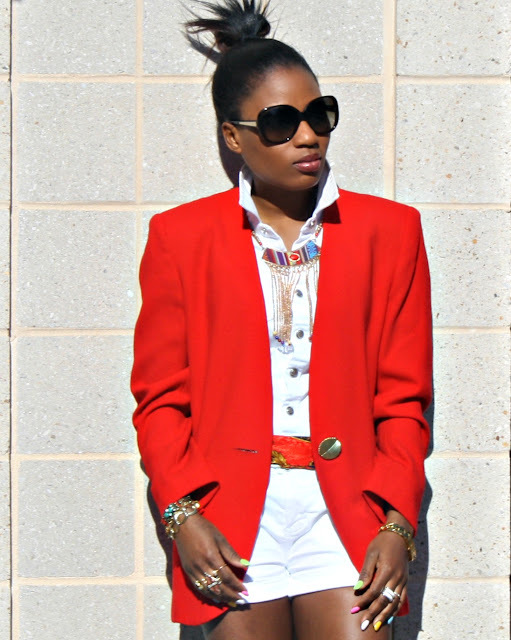 That red blazer is fabulous, vintage dior huh? I also love the floral dress too! I want your blazers girls! And the rest of your outfits! Love the romper and the dress! Awww, happy belated! Hope it was a great day for you! I love that F21 dress and the vintage CD blazer is gorgeous! You both look glam as always! Such a pretty blazer! I need one! OMG...you look gorgeous!! Beautiful outfits!! Love both of them, but the pink one is absolutely adorable! Those are both fun looks. Happy belated birthday Dammmie. So as usual I wish I had both of your outfits but I'm lusting after that vintage Dior blazer!! ah the mint and floral combination is so pretty!